A squeeze page is a page designed to grab the users attention & attempt to obtain their contact details by drawing them in to your offer. The idea is that the visitor will see a compelling headline & it will entice them to read further, but the problem is that if your landing page isn’t mobile friendly then they’re going to have to pinch the screen to zoom in and it’s just not going to have the same effect. 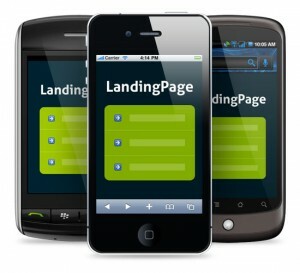 By making a simple change & creating a mobile friendly landing page you could see a dramatic increase in conversions. The majority of emails are actually opened on a smartphone so catering for mobile users is vitally important. I’d highly recommend LeadPages to anybody as the majority (if not all) of their templates come responsive as standard so they scale to the users device. Not only that but they’ve all gone through thorough testing to make sure the conversion rates are as high as possible. Plus LeadPages provide conversion tracking & make it super easy for you to make edits to each of your pages. If you’re on a shoestring budget (or just tight), then you’ll be glad to know LeadPages also offer a whole load of free templates that you can download and use and the majority of them (again if not all) are responsive). So without further ado, here’s LeadPages’ ultimate list of free landing page templates. Of course if you do decide to go down the route of using the free landing page templates remember you’ll have to host them yourself so you’re going to need a domain name & a web hosting account. I recommend Godaddy for cheap domain names & HostGator for cheap web hosting, however for the price you’ll be paying to self host maybe you should just consider signing up for a LeadPages account? Has MOBE Been Shut Down By The FTC?